This past weekend, I attended the biannual Nova Scotia Guider Conference. 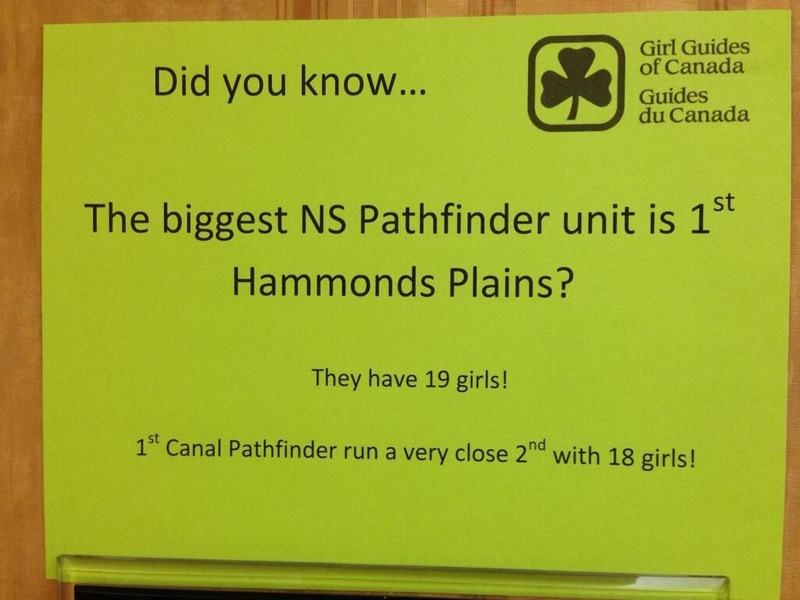 Every two years, Province puts on a learning weekend for all provincial Guiders (and Rangers this year). It's a great time with lots of learning and laughing. On Friday, once we found the hotel (Truro is not that big! ), it started with the Opening Ceremonies. Our Chief Commissioner Sharon Callahan was a surprise guest and said some words, along with our Provincial Commissioner Holly Thompson. The MC and Conference Chair Debbie Mellish was hilarious the whole weekend and did a great job keep things moving. Then we sang Make New Friends in a round and it sounded great. That's how long I want to be your friend. Then we invited all of District Guiders who were there (6, plus our Area Commissioner) back to our room to hang out and we had lots of fun. In the morning after breakfast, we had a joint session on Social Media, let by @talya_talks, who moderates GGC's social media sites like @girlguidesofcan and the GGC Facebook page. Nova Scotia has just started their Twitter feed @GGCNovaScotia and Facebook page and Talya talked about how we can help build that up and why it's important. I don't tweet often--I use my Twitter for reading mostly--but I then spent the day tweeting all about conference #nsguiderconference. My morning was a double session, which was a hike and geocaching. 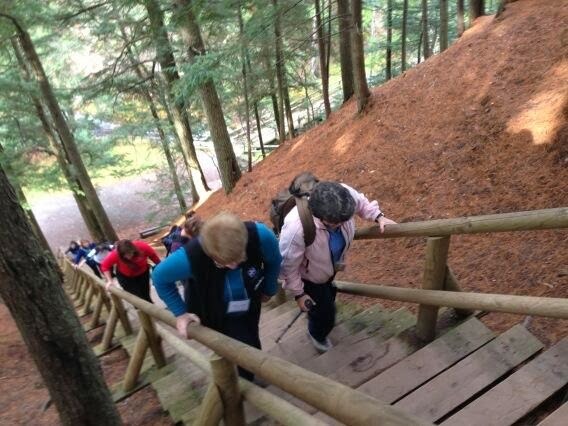 Victoria Park is a 400-acre woodland park and trail system right in Truro--we could walk there from the hotel. We stopped to try to find a geocache at a small park on the way, but it was hidden too well! We were all around it but just couldn't figure out where it was. There are two main features at Victoria Park. The first is Jacob's Ladder, a 175-step climb! There is a break about halfway up, which most people took advantage of. The picture is from the halfway point, so we still had a ways to go! 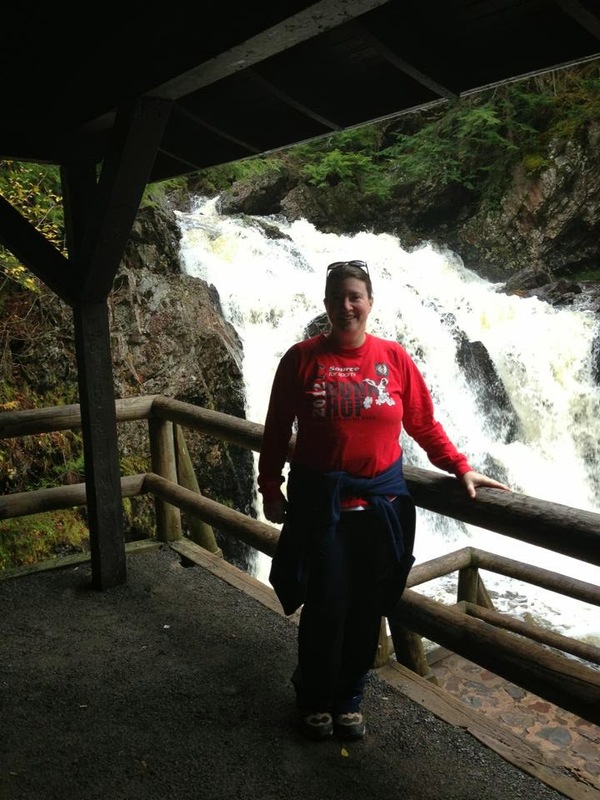 The second are the falls--Waddell Falls and Joseph Howe Falls. We'd had a wet week leading up to the weekend, so the falls were flowing beautifully. We were hiking for 3 hours and it was great to get out of the hotel and in the fresh air. Brenda Harvey was our facilitator and since she is local to the area, had lots of great information and tidbits about the park and Truro. 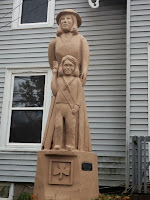 The streets of Truro have tree carvings that were commissioned when a lot of the old elm trees had to be cut down due to Dutch Elm disease. 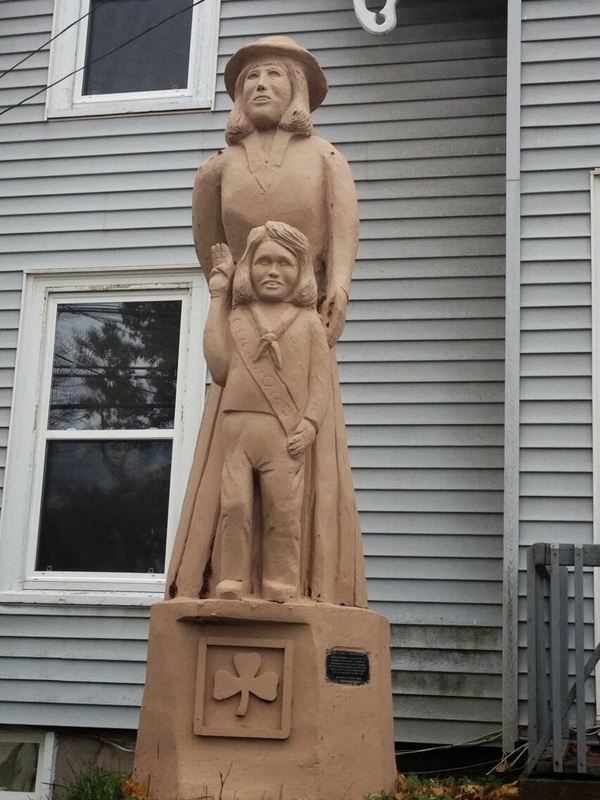 On the way back from Victoria Park, we went down the street that had the one that the Colchester Area Girl Guides commissioned. My first session after lunch was called Trendy Crafts for Guides and Pathfinders. Jennifer Trott-Zisserson is a Guider who is also a Grade 5 teacher and she loves to craft purposeful crafts--more than just colouring and fun foam, which is good for the younger levels but the older girls do want more. She explained Pinterest to those who didn't know what it was and talked about some great craft ideas, like screen printing. Then we got to do some crafts of our own. She had three quick crafts for us to try. Glitter balls--these are really easy and really pretty. 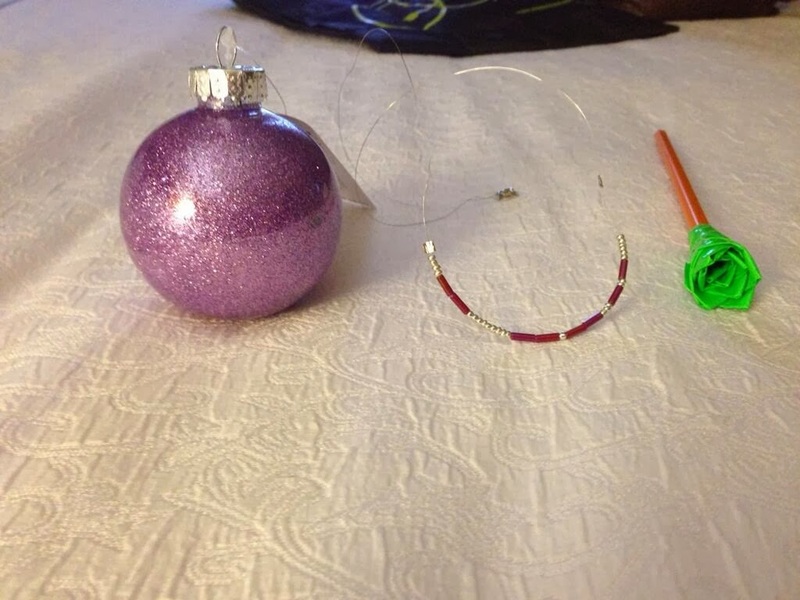 You take a clear plastic or glass ornament ball that you can find at Michael's. You pour clear Pledge cleaner into the ball and swish it around to coat the inside and then pour the excess back into the bottle. Then you pour glitter into the ball and it sticks to the Pledge. It takes more glitter than you expect! And that's it! Morse Code necklaces/bracelets: This was tedious, though smaller finger might do better with it, and I do like how it turned out. You think up a message in Morse code and write it out (mine says "4th HP Guides"). You add the clasp with crimping beads, then add your message, using long beads for dashes and round beads for dots. You can put crimping beads at each end of your message if you want to keep the message from sliding on the necklace. Duct Tape Roses: I really liked these and they were quite easy to make too. Cut strips of colourful duct tape into 1" or 1.5" inch strips. You need about 20 (mine had about 10 on it). You fold one corner down not all the way to edge and then fold the other corner down to make a point in the middle. You can either roll it up on itself or around a pencil (like I did). Repeat this for all the other pieces, wrapping them around the first one and staggering the points. My last session was Drama Queens--Using Drama with Guides and Pathfinders. I signed up for this because I'm not always imaginative and I don't enjoy drama so I wanted some new ideas. As a result, I was dreading it because I knew I'd be out of my comfort zone, but it ended up being my favourite session! There were 15 of us in the session and it was led by Charlotee Dornadic and Darlene Duggan. Charlotte is a drama teacher and has been a Girl Guide member for over 55 years. We learned lots of games and there were a number of outgoing, drama-types in the session, so we laughed a lot too. We had a bit of time after our last session before supper so we worked on the Scavenger Hunt. With our registration package, we got a list of about 40 questions, and the answers were posted around the hotel. 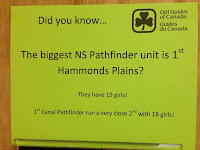 We were proudest of the fact that the largest Pathfinder unit in the province is found in our District! Dinner was a sit-down turkey dinner. 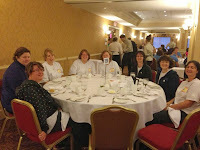 Though we did mix and mingle throughout the day, we had a lovely meal with all of the Guiders from our District. We were joined by some Guiders who had just come for the day, as well as some who we hadn't connected with the night before. After dinner we had a short group session on the changes to Safe Guide, including the importance of everyone reading the SG4 and knowing what to do in case of an emergency. After that we had campfire, which is always fun. We learned some new songs and sang some old favourites. I finally liked the song "Three Sharp-Toothed Buzzards"! I never understood it before. And Ain't No Flies on Us brought out the competitive side in everyone involved! We had another evening of fun and good times in our hotel room. We were all very thankful that the clocks went back an hour and we got an extra hour of sleep! Sunday started after breakfast with an Ideas Market. People bring hat crafts and crafts and crests to sell to raise money for various things like CWFF or international trips. There were camps promoting their facilities and an Area promoting their challenge. And we ended the weekend with a closing, giving out door prizes and Scavenger Hunt winners. We ended with Go Well and Safely, one of my favourites, and Daytime Taps. Conference is always a fun weekend. There are lots of sessions available. Commissioners did COGS, there were the Program Stream sessions, people skills, crafts, drama, outdoor skills. The Conference Team did an amazing job putting everything together and I can't wait until it's time to do it again in two years time!